Arriving early? Take advantage of an optional outdoor adventure. Test your back country skills with a guided snowshoeing tour of beautiful Tabernash, Colorado, followed by hot chocolate at Heck’s Tavern. Join us for drinks and dinner at Volario’s Ristorante. What is an experiential activity? Imagine fly-fishing, a hut-to-hut trip, ice climbing, or motorcycle touring with your colleagues in the name of personal and professional development. How can adventure fit into your life and your organization to make you a focused marketer? We’ll split into two groups and take turns walking through database and all the other so-called soft marketing. These sessions will uncover what you’ll need to concentrate on in the next 30-90 days of your plan. When we said “boot camp,” we meant it! Devil’s Thumb General Manager Dan Abrashoff joins us for a lunchtime discussion. Devil’s Thumb Ranch (DTR) boasts unique boutique features many resorts are investigating. To thrive using sustainable practices, DTR uses geothermal heating, solar panels, and compact florescent light bulbs throughout the property. Farm-to-table dining reaches beyond the herb farm to the working ranch that surrounds the resort to supply fine dining with its own grass fed cattle. During this working lunch, you’ll learn how you can change your operations by thinking beyond the norm. Your database may be one of the toughest things to understand and set correctly. Get ready to sweat the numbers. Moving the needle…increasing market share… These are ideas that float around in all of our operations. To understand competition, we must understand the underlying forces and the structure of the industry. In this session, Joshua LeDuff will walk you through a path to strategic thinking. Followed by a private whiskey tasting at Idlewild Spirits Distillery. Thinking of our brands as more than logos, can increase the value of our businesses by creating trust, improving recognition, delivering a clear message and motivating buyers. We’ll review your brands and provide a roadmap to thinking or your brand AS your business. How do you learn? How do you absorb new information? When a new series of reports flood your inbox, do you phone a friend? Do you read until your eyes bleed? Or do you deconstruct into information you can now work with? Darcee Kissler will help you identify the best path to greater learning efficiency. And then, she will help you learn to adapt your teaching styles to better engage employees. Winter Park Resort President and COO Sky Foulkes joins us to discuss the challenges we all face. Preparing for a change in ownership? Assessing the next round of capital reinvestment? Managing a seasonal workforce? Promoting a destination property with outlets you don’t own? Sky will join us for a lunchtime discussion to field everyday challenges you both face. 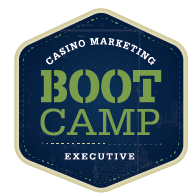 We’ll look outside of the casino industry to explore best practices. How do they look at their market opportunities? What are they doing that we can copy? Where do we go next? Roundtable discussions of the next 30 days. Graduation celebration at Devil’s Thumb Ranch House Restaurant & Saloon, followed by stargazing and s’mores at Heck’s Tavern.